Second item: I wanna share a link to the art/comic blog of my friend Kathleen. She is a designer in Canada who draws fun comics in her free moments that are like some wonderful mix of Archie, Jem and the Holograms, and Smashing Pumpkins. Enjoy Kathleen’s Sketchbook! Third item: Japan Needs Heroes. 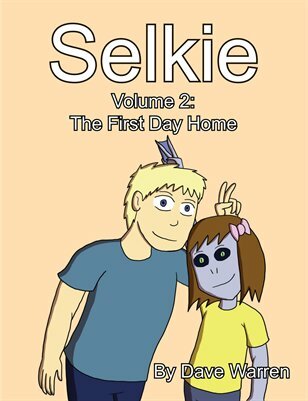 This project is a collaboration of print, newspaper, and web-based comic creators to compile a collection of short stories about hope and rising above strife, with proceeds going to benefit recovery and relief in Japan for those suffering from the devastation of the earthquakes and tsunamis. If you’re like me and have not yet donated to relief efforts but would like to, this is a great opportunity to do so. My thanks to Jade Griffin for bringing this project to my attention. I suppose vomit-fish and stars are not so appealing when they’re up close and personal instead of crayon drawings. I have to agree, the privacy screen is fantastic! I love how Selkie’s teeth in the third panel match the trim on her dress! Hey, I’ve been lurking for a long time while trying to be brave enough to comment, and the awesome is just getting to be too much. I actually don’t have much to say, since I absolutely love the comic, and that’s been said by a billion other people. Thanks for creating this! I, too, love the privacy screen, but given Selkie’s face in the last panel, I have to wonder… has she ever looked in a mirror before? Or recently? I hate that I have to wait till Monday for another comic. I don’t know what it is about this series, but it’s just so charming! lol, I didnt get the privacy screen thing at first. I also love the newly designed dress. Wild speculation: With her hair like that, she looks like her mother. Well, if you remove the black widows-peak, it does sorta look like it. But yeah, I’ve been wondering about that too. 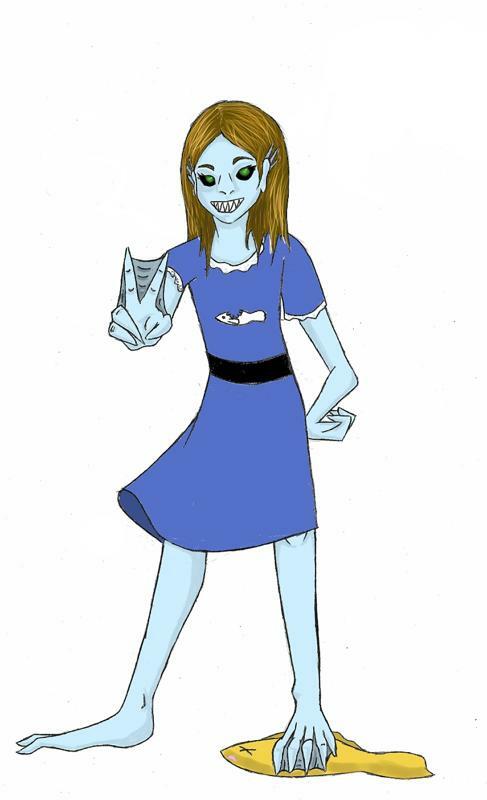 fan art> I love that it isn’t a seal but a fish with a bite in it on her dress! Could’ve sworn the dress she wore when they first met was a different color. That’s some pretty great fanart. We only saw her first dress in color once; the strip was black and white before then. I just love this comic. I look forward to its updates, and will check back like every 3 hours to see if it updated even though I know it doesn’t work like that. I’m just impatient, but in a good way. 😉 For some reason… I keep thinking of this fishy dress I had as a kid. It was lime green with brightly colored fish all over the bodice. I loved that dress. Ask your friend if she’s fixed the bug that was making her comic site inaccessible. It must be fixed, I just now pulled it up from the link above.